Thanks to - Allen, Leila, Dacia, Jessie, Chelsea - for the collaborative painting. 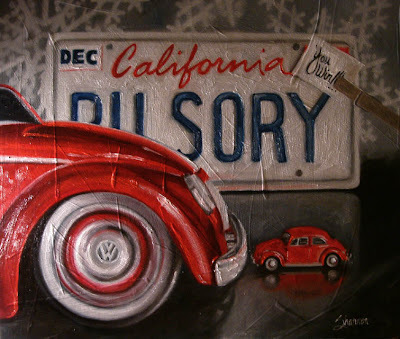 Here are the words - slug bug red, laundry, snow, star, sorry. Here is the painting. Terrible photo. Used an old textured board that I don't much like. But, it's done. This morning I was a little disappointed (that no one posted a word) but relieved (that I didn't have to do a painting) because today's Friday thing was something I've never done before. I told Allen and then he decided he was going to post something. I said, "No, it's past the time. Now I don't have to do a painting." He said, "It isn't past time because you haven't started." We went back and forth. He posted. I don't know why it made such a difference that it was posted but it feels more 'real' that way. Then I had to do it. When I read his word I laughed. He looked around the studio and saw my VW bug collection. Then there were a few other posts. And of course they weren't late because I hadn't started yet. So, the slug bug 'face off' was Allen and I going back and forth. Then we've had discussions of who is which slug bug? And who won? This is a great painting! See, you did it. Go Dad!!! Cool painting! That's amazing that you can just whip out a painting that quickly! Love it! And now you know why my word was snow. You should check out my latest post about SNOW!! *Edited to fix my retardedness of the first comment! Sorry Shannon, I knew it was a painting, it must have been really late! Nice! I love your creativity. You incorporated it all so well! haha i really love this! show gramma and sara for sure.